Okay, you might be wondering why I am encouraging you to learn how to make a business website on your own, when I’m in business of selling website development services? The answer is simple. I’ve worked with too many small business people whose marketing is being strangled to death by the well-meaning but often ill-advised information about company websites. I have gotten so sick and tired of watching people lose customers to their competitors because they thought that creating a website was too expensive or too much of hassle. In today’s tough economic times, no business can afford to miss out on THE most powerful marketing tools available today — a customer-focused website. I will tell you about how you can make your own business website, faster and more affordably than you ever thought, but first, I gotta get this off my chest. Nothing ticks me off like an unethical internet marketing company or web designer who puts up a site for a client then holds them virtually hostage with expensive monthly web hosting fees, sky-high hourly maintenance charges or some other BS. I have had clients who were paying good money for websites that were down – completely invisible online – and they didn’t even know it. Or web designers who only offer custom designs (costing 1000’s of dollars) – which is fine if you are a well-established business with deep pockets or well-funded start-up. Or other I have had clients who wondered why their online sales had fallen off, when it turns out that their web shopping cart was throwing out error messages left and right – totally scaring buyers away. Or some online marketing agency hires a bird-dog team to cold-call and drum up business with local business folks. People who might not understand that they don’t have pay $45 a day to have someone upload 3 Facebook posts and 3 Tweets for them. (And yes someone did try to sell this ‘bargain’ to one of my clients). Or non-technical people who are VERY smart and savvy about their business, yet who get freaked out by the entire concept of marketing online. But it doesn’t have to like this. Online marketing is not rocket science (yes, really). Okay, it may seem like web marketing is difficult at first. But let’s face it that’s a learning curve for anything that is worthwhile. Now of course there are lots of other sub-tasks you have to complete but there it is – but these are just five things every business owner needs to know in order to get starting promoting their business online. 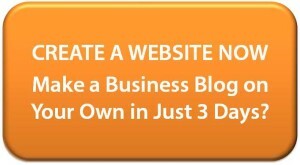 Yet, I have seen business people work very hard to skip over that first step – creating a website! They start mini-blogs on Tumbr or Facebook, signup at Blogger or some other ‘freebie” website – all to avoid building a website of their own. I understand people think that they are ‘saving money’ – but like the person who drives all over town looking for ‘bargains’ on pork chops or bread is actually losing more money by wasting their gas and time than they could ever recreate with any cheap deals they find. The same thing happens when a business person avoids building a customer-focused website while trying to promote themselves online – they are very busy – losing customers and sales. Now this sounds harsh – but the facts are that more and more people use the Internet to find local companies then ever before. Studies have shown that more people now use the internet to “shop” and find companies than they do the yellow pages, printed ads or mass media commercials. But the kicker is that most of your customers see your company website as the “proof’ that your small business is legit – just like in the 50’s and 60’s, people used Yellow Page ads to “pre-approve” companies. In the past people thought if your company was too small or too cheap to buy at least a small yellow page ad, you must be fly-by-night. And to a certain extent, you and I both know they were right. Well nowadays people (your prospects and customers) and using the Internet and a company website as proof of your legitimacy. This is why I developed my book, “Get Up and Running Fast”. This self-paced training manual was designed to show you how to do the first of the five online marketing building blocks – creating a WordPress website for your business. If you are serious about growing your business by using the Internet and your website is NOT working for you (OR you don’t have a website at all), then I invite you check out my book, “Get Up and Running Fast”.